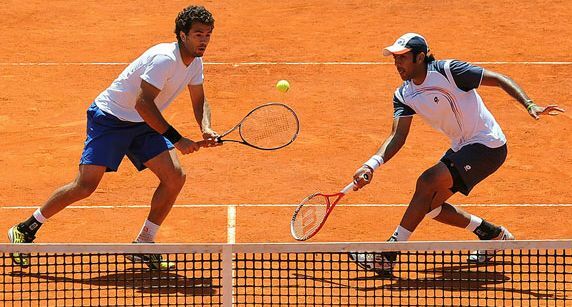 The Pakistan-Dutch duo Qureshi/Rojer play the men's double semi final against the third ranked American Bryan Brothers at Court Suzanne Lenglen Thursday afternoon. Aisam-ul-Haq Qureshi has earned his best position at Roland Garros French Open by reaching its semifinal, whereby he also boosted his prospects of getting a berth in the London Olympics. This is the second time Aisam has reached the semifinal stage of any grand slam. Aisam and Jean Julien Rojer defeated the pair of Michael Llorda of France and Nenad Zimonjic of Serbia, who are ranked 5th and 6th respectively On Tuesday to reach the semis. If Aisam-Rojer pair won the Open they would get 2,000 points. If they lose the final they would earn 1,200 points. Winning the semifinal would bag them 720 points. But Aisam, currently ranked 16th, needs more than 1,000 points to be among the top ten players - so this means the Aisam/Rojer duo must win the Roland Garros semi Thursday. Well best of luck then Aisam and Rojer for Thursday's semi.